The Eagles Lupopo (A.K.A. The Eagles Band, Eagles Lupopo 77, King Eagles Lupopo, Daudi Kabaka & His T.B. Eagles) were formed in Nairobi, Kenya by Daudi Kabaka in 1972. Kabaka was born in Kyambogo, Uganda in 1939. By the time he was twelve, his family had moved to Nairobi. In 1954, Daudi recorded his first composition, “Nie Kabaka Naimba”, for the CMS label (Capitol Music Stores). In 1959, he began working with Equator Sound Studio and soon became a salaried member of the house band – The Equator Sound Boys (A.K.A. The Equator Sound Band, The Jambo Boys). Through out the 1960s, Kabaka recorded a number of hits for Equator Sound, including “African Twist”, “Harambee Harambee” and “Helule Helule”. In 1967, his song “Helule Helule” was covered by The Tremeloes and it became a hit in United Kingdom – reaching number 14 on the charts. But owner / producer Charles Worrod had registered himself as the composer / arranger of the songs released by his label. This eventually led to a falling out with most of musicians on the label over royalty payments – including Kabaka who by that time had registered with the PRS (Performing Right Society) in London. Kabaka resigned from Equator Sound in 1972, and with some of his old Equator colleagues launched their own production company – African Eagles Recording, Ltd. The label copied the Equator format of having a house band that sometimes recorded under its own name – African Eagles Lupopo – and sometimes served as a backing group for other musicians and singers. The studio band originally included Gabriel Omolo, Sylvester Odhiambo as well as the Zambian émigrés Nashil Pichen and Peter ‘Tsotsi’ Juma. 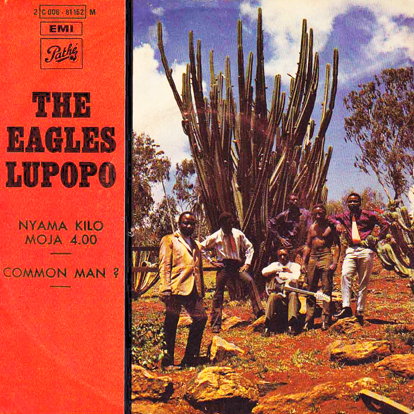 You can find two songs by The Eagles Lupopo 77 on two different compilations: “Ajali Ya Mombasa” on AI Records “The Essential East African Collection Vol 1” and “Dina na Jim” on Next Music’s “Essential East African Hits Volume 2”. Daudi Kabaka, passed away on November 26, 2001. Catalog number on 2 C 006 – 81152 M on EMI / Pathé, pressed in France. No release date listed. Always appreciate the Africa posts–thank you. I miss you. Where are you? I’m here… Just doing something else.